Today in Masonic History Émile Maximilien Paul Littré passes away in 1881. Émile Maximilien Paul Littré was a French lexicographer. Littré was born on February 1st, 1801. His parents were themselves free thinkers and influenced their son in the same direction. He was sent to Lycée Louis-le-Grand, a prestigious secondary school just outside of Paris. After he completed his studies at the lycée, he could not decide on a career path to follow. He first began by working to master German and English, classical and Sanskrit literature, and philology,the study of language in written historical sources. By 1822 Littré had decided to study medicine. In 1827 after passing all of his examinations and with only a thesis between him and his medical degree, his father passed away leaving his mother without the means to support herself. Littré without hesitation left school and found a job teaching Latin and Greek. Littré served as a soldier for the populists during the July Revolution of 1830. In 1831, Littré was introduced to the editor of Le National, a French daily paper. Initially Littré was tasked with reviewing German and English papers looking for news. By 1835, Littré had demonstrated his writing ability and began being a regular contributor to the paper and eventually it's director. In 1839, Littré published the first volume of his complete works of Hippocrates. It was in that same year that he noticed the works of Auguste Comte, a philosopher dedicated to the idea of positivism. Positivism, a philosophical theory that certain "positive" knowledge is based on natural phenomena, became a ruling philosophy in Littré's life and Comte his mentor. Littré was devoted to Comte, it was not until later in life that Littré's opinions began to stray from some of Comte's. Although Littré remained convinced of the core philosophy as stated by Comte, some of the outer elements were questioned by Littré. It wasn't until Comte passed away that Littré began to publish his own works in some places contradicting his former mentor. In 1844, Littré began work on his greatest work Dictionnaire de la langue française. A French language dictionary which included the history of every word in the language. The final work was 415,636 sheets packed into eight wooden crates. It took nearly 30 years for the work to be complete. In 1863, Littré finished his complete works of Hippocrates. That same year he was invited to join Académie française, the per-eminent French council for matters pertaining to the French language. He refused the first invitation due to a conflict with Félix Dupanloup, bishop of Orléans who was also a member of the Académie. In 1871 he was invited again and accepted. This time Msgr. 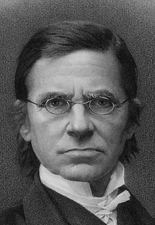 Dupanloup resigned after protesting Littré's acceptance into the organization, refusing to greet Littré as a member. Littré served as a Senator at various points in his life and was elected as Senator for life in 1874. Littré passed away on June 2nd, 1881. A wise man of ancient times, who was ask'd the same question by a king, thought about an answer for days, but was never able to answer. I please you not to request an answer from me. No science denies a "first cause", because it finds neither another warrant nor proof. All knowledge is relative and we always meet unknown phenomena and laws we don't know its cause. The one who proclaims with determination to neither believe nor disbelieve in a God proves not to understand the problem of what makes things exist and disappear.